Lesbian, gay, bisexual and transgender people in the United States face unique barriers to care and resources as they get older and require long-term health care. However, there are a number of federal and state agencies available to address issues of discrimination in California that arise due to sexual orientation and/or gender identity. There are an estimated 2.7 million LGBT adults aged 50 and older in the United States, and 1.1 million who are 65 and older. While many older adults face issues of economic insecurity, lack of adequate, affordable health care, ageism, and difficulties getting the help they need as they age, those challenges are compounded for LGBT older adults. In addition, LGBT older adults face their own unique challenges as a result of a lifetime of both individual and structural discrimination. A new report, Understanding Issues Facing LGBT Older Adults, provides an overview of the unique needs and experiences of LGBT elders. The report, by Movement Advancement Project (MAP) and Advocacy & Services for LGBT Elders (SAGE), is intended for service providers, advocates, the aging network, and policymakers, and includes policy suggestions as well as best practices for serving a population of LGBT elders. How can legal services better meet the needs of low-income LGBT seniors? This special report addresses specifically how legal services can best meet the unique needs of low-income lgbt older adults. Provides an overview of current and pending Federal and State laws and regulations that pertain to the rights and protections for the LGBT population and for domestic partnership. These agencies and associations specifically serve California residents by helping them access social services such as case management, friendly visitors programs, affordable housing, health care assistance and legal issues. 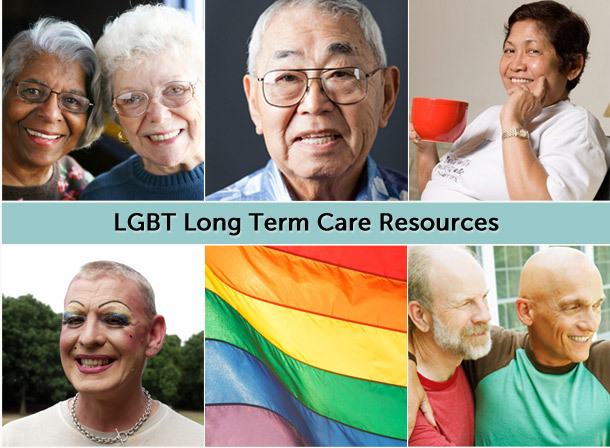 You will find a collection of recently published reports and fact sheets from the media, academia and agencies relating to LGBT long term care issues and other pertinent topics.